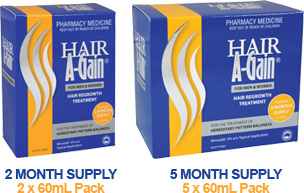 Hair A-Gain is available in two pack sizes: 2 x 60mL (2 months supply) and 5 x 60 mL (5 months supply). Each pack contains one child-resistant dropper applicator. Hair A-Gain is available without a prescription from your local pharmacy. Hair A-Gain 5% lotion is a solution that is applied directly to the scalp twice a day using the dropper supplied in the pack. It is simple to use. Hair A-Gain contains the active ingredient minoxidil. It also contains propylene glycol, water and alcohol. Use the applicator to apply 1 mL to the hair loss area twice daily. Apply only to dry scalp. Gently spread & massage lightly throughout the hair loss area. Do not use more than 2 mL daily. For external use only. Do not take orally. Avoid contact with eyes. It is important to remember to apply Hair A-Gain twice a day, every day. Treatment with Hair A-Gain 5% lotion is a long term treatment for hair regrowth and continuous use is required. Always read the label. Follow the directions for use. If symptoms worsen or change unexpectedly, talk to your health professional. © South Pacific Pharmaceuticals Pty Ltd. All rights reserved.